Four groups of emerging leaders from the MRC have now taken part in the Australian-based PDPs, developing fresh approaches to crucial issues facing the 60 million people in the Mekong sub-region whose livelihoods are supported by the river, mainly through farming and fishing. The latest group of 11 men and 10 women, which focused on the increasingly important issue of Integrated Groundwater Management during their stay in Australia, included six professional staff and academics from Thailand, five from Vietnam, four from China and three each from Cambodia and Laos. The six-week programme centred on short courses, field visits, peer-to-peer meetings and workshops staged in Adelaide, Darwin and on the Gold Coast. AusAID’s Australian Leadership Awards Fellowships funded the representatives from Cambodia, Laos, Thailand and Vietnam, while the Chinese delegates were supported by the Australia-China Environmental Development Partnership. The PDPs are part of a series of ICE WaRM initiatives as it supports the MRC’s Integrated Capacity Building Programme and develops long-term relationships with the Commission, as well as other government and academic partners throughout the Mekong sub-region. 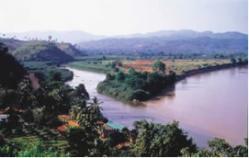 The Mekong River is around 2700 kilometres long and runs through China, Burma, Thailand, Laos, Cambodia and Vietnam. Although the basin remains relatively unpolluted, rapid economic development, coupled with increasing population pressure, is degrading the environment and raising conflicting water-use needs.